If you’re shopping for a child’s birthday present, you might fork out a lot of cash on top of the gift itself. Fun “building blocks” gift wrap is $5.99 (for a 24-inch by 36-inch piece), bows cost $3.58 (for a pack of 30, which works out to a reasonable 12 cents each) and a fun Spiderman birthday card is $4.99. That equals $11.10 in wrapping materials and a birthday card for a single present — which really adds up over a year’s worth of gift-buying. And with the holidays coming up, now’s the perfect time to consider ways to save money on wrapping paper and cards. Stop spending so much of your hard-earned cash on stuff that will end up in the trash. 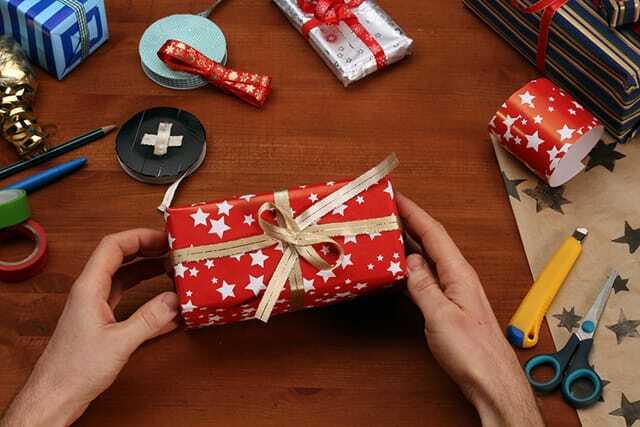 Follow these tips to present your gifts with flair, yet save your cash. Two brothers, Jeff and Ron Methier, don’t spend much on their birthday cards. For the last 42 years, the men have passed the same birthday card back and forth. Each year, one signs his name and adds a short note before sending it over to the other man. While you don’t have to go to such extremes, plenty of people cut up and re-purpose old cards, turning them into new ones. One common strategy: Cut off the front of the card and use it as a gift tag, taping it directly to the present. Here’s a guide to turning your cards into cute gift tags. If you buy a greeting card at a specialty card shop, they can cost $5.99 or even more. For a fraction of that price, you can do your card shopping at one of the ubiquitous dollar stores. Stock up on cards next time you’re at a dollar store so you have a few on hand for all occasions. Look for multi-card packs, especially around the holidays, to reduce your per-card price. And don’t forget to scoop up low-cost wrapping paper, gift bags and tissue paper. While selecting a unique and personalized card can add that special touch, the message you write is the most important part. Stock up on cards that are blank inside and you can personalize and customize each one for any occasion. A cute puppy card could be used as a congratulations card, a “get better soon” card, a birthday card or just about any reason. Blank cards are usually far less expensive than cards specific to certain occasions. Create your own custom blank cards at Shutterfly or one of the other photo-product sites. Be sure to sign up for special deals and offers, since you’ll receive great coupons and even occasional free cards. Right after Christmas is the best time to stock up on Santa- and reindeer-themed gift wrap. While the selection is largely picked over by this point, the rock-bottom deals will make up for it. Retailers are looking to clear their stores of these bulky and inexpensive items, and they’re willing to drop their prices to do so. The longer you wait, the better the deals: You may be able to find paper for 80 to 90% off the original retail price. Why spend dollars on wrapping paper when you can print your own for pennies? Make sure your printer ink’s full and get ready to find free printable cards online as well as other items. Pinterest offers a wealth of free printables including gift tags, calendars and more. Buzzfeed also put together a list of 24 cute gift tags you can download and print out for free. Grab the Sunday comics out of the recycling bin and use them to wrap presents. This old-fashioned technique adds a fun and playful touch while reusing paper. You can even customize the comics to the recipient — if your friend’s a Snoopy fan, make sure Peanuts is front and center. Grab a roll of butcher paper and some stamps and go wild to create your own custom gift wrap. If you have kids, let them add their artistic touches. If you want to skip the butcher paper, just grab paper grocery bags, cut them open and decorate the blank side. Need more ideas for DIY gift wrap? Try these suggestions from Buzzfeed. Why send a paper card when you can send an e-card instead? Check out Blue Mountain or Someecards for free e-cards you can send to friends and family members. Someecards also has a good selection of fun and everyday ones, including fantasy sports-themed and even “Grumpy Week” cards. Before ripping off that wrapping paper and crumpling it up in a ball, think of the paper as a second gift. Carefully remove it and take a few extra seconds to fold it, or wrap it around a gift wrap roll to keep it for the next gift you have to wrap. Gift bags are even easier to reuse, since they’re often in perfect condition. This goes for the tissue paper tucked inside as well — just fold it along the creases, and it’s ready for your next gift-giving occasion. Instead of paying $4 to $6 for each card, why not make your own cards? If you have kids, this is an especially fun way to add a personal touch. Get some colored card stock from a craft store. You can typically buy a pack of 50 or more sheets for under $15 at regular price, but craft stores such as Michael’s often have specials and coupons. Or if you’d like to spend even less, consider snagging a pack of construction paper. You can get a 50-sheet pack for $2. Then, get crafty. Print out fonts on your computer, make a photo collage, sprinkle on some glitter, and send your loved one a personalized and unique card for their celebration. Stop by your local thrift store and pick up some rolls of paper, gift bags and more. You can often find rolls of gift wrap for just 25 or 50 cents apiece. It might be tricky to find Santa Claus paper around Christmas time, but if you keep your eyes out year-round and don’t mind the randomness of the rolls, you can find great deals on gift wrap at thrift stores. Also look for gift bags, unused gift tags and more. Your Turn: What are your money-saving tips for buying gift wrap and greeting cards?